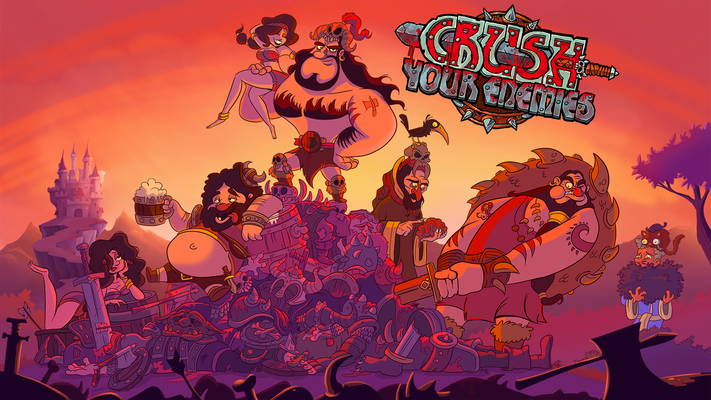 Crush Your Enemies hides a surprising strategical depth behind its crude humour. Whilst simple, it provides just enough challenge through the fast pacing to keep you engaged until everything in your path has been destroyed. Two of the lead developers behind emotional survival game This War of Mine could not have gone in a more contrasting direction when they chose to work on Crush Your Enemies. Forget the dark landscapes, and wipe away any tears, it’s time to destroy all in your path, drink beer and paint the world red. 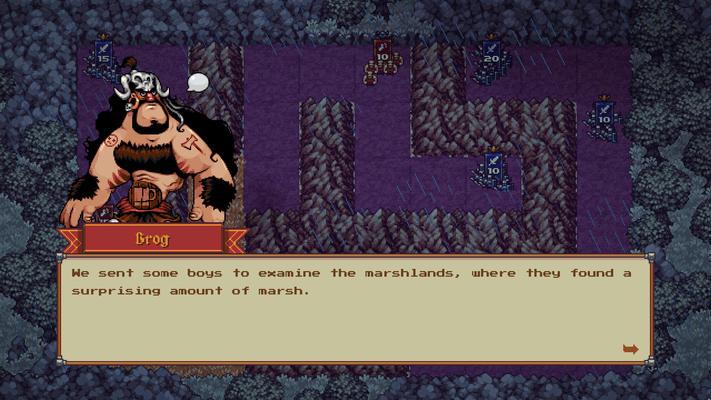 Getting into the spirit of things is Brog and his crew of Barbarians. He’s determined to fulfil his motto: crush your enemies until there is no one left to destroy. It’s a vague, yet fitting story for the gobby leader and his fat, dribbling son; giving just enough input to keep things moving forwards. I found there to be a little too much reliance on crude language, although a few of the ‘I see what you did there’ references did get a small smirk. Luckily the characters, and their brand of toilet humour, left me alone during the gameplay. 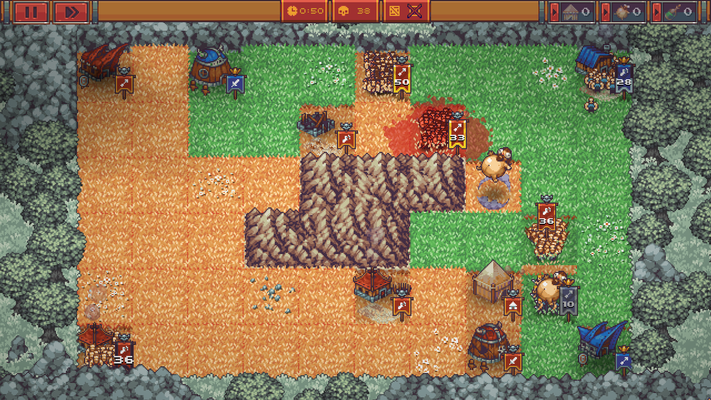 General strategy in Crush Your Enemies is one of numbers; overwhelm your foes with more soldiers and power. After that everything comes down to how good your skills are with the left mouse button. Click the group you want to move, choose how many you need and select where they should go. As long as numbers are in your favour, anything in the way will be pulverized without question. 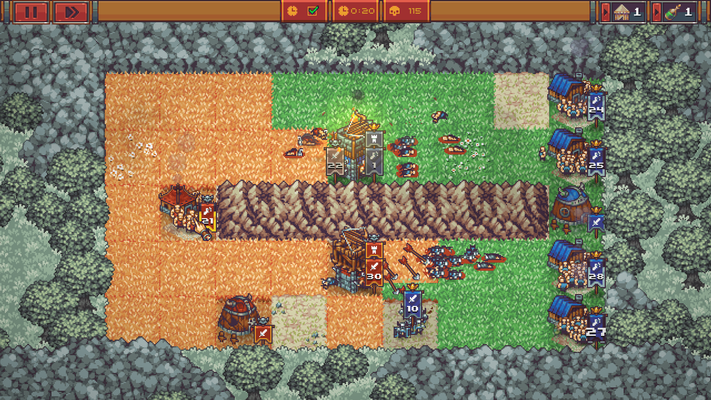 These simple controls mean the ability to organize troops as quickly as you can think up a plan. The downside being that it never gets more complicated than that, so players looking for depth won’t really find it here. Regardless, Crush You Enemies provides enough elements to require focused attention at all times. For example, the field of play is divided into small squares, the colour of which representing who currently owns them (orange for Barbarian, Blue for the enemy, White is neutral). It’s important, because even though both sides can move anywhere on the field, they’ll pause in their march (or refuse to attack) until they’ve made the enemy square their corresponding colour. Tactically, it’s advantageous to own as much land as possible, as the pause in momentum that occurs while a team is conquering the land is a good opportunity to attack. Keeping the fights interesting is the ability to change your Barbarians’ class. The most important ones are the reproduction huts that add to your ally forces, so long as at least one member is inside. Other Barracks (Warriors, Archers, Shield Bearers, Scouts and Wizards) change the stats and abilities of the group that passes through them. Archers, for example, have poor stats but can be used to rain arrows on nearby enemies. Meanwhile, Shield Bearers, with their high defence, are able to bounce enemy arrows back towards their foes. It’s a small list of typings, but ultimately allows for greater efficiency and knowledge of each one. Changing things up even further is the resource management elements added to the second campaign. It means having to cut down a certain amount of trees before making use of buildings, and collecting meat in order to gain allies. It gives a nice extra dash of strategy, although I didn’t find it to do quite enough to stave off the stages in general from getting repetitive. Helping a little with the same-y gameplay is the conditions given to each stage, offering a head on a spike for your troubles. Additional time limits, having to keep a certain number of troops alive, and other such conditions, provided a fun way to feel smug about my skills. Having said this, there were only a couple of conditions that really stumped me, and since it’s possible to play all the stages of the first campaign with 50 out of 72 heads, most players will get through without any serious problems. The biggest annoyance to Crush Your Enemies was actually the fast paced AI. They are almost always given more resources from the off, and are quick to move their pieces around the board, as they don’t have to faff around with the clicking and dragging bit. While I was making choices with my slow human brain, the AI had already sent 2-3 waves in my direction. For this reason, making a small mistake, or fumbling for too long over an action, would be enough to set me up for a loss. Buying items with beer can help to give that much needed edge over our computer overlords. In fact it’s about the only thing that you have access to that the enemy doesn’t. Good ol’ Shroom Moonshine doubles your strength, while the Dummy Barbarian will take over territory while acting as a decoy. The only snag is that they don’t last very long. Poor Dummy will pop if an enemy so much as breathes on it, and the strength enhancer doesn’t last for more than a few seconds. If you want a change of pace, then it might be an idea to test out the multiplayer. You can choose between a quick match which will put you on a random map, a regular match where you get to choose where you battle, or playing against a friend. It was really refreshing to compete against less predictable human beings, as there’s just more urgency to the whole thing. I may have even given the air a small victory punch when I had a glorious comeback in a particularly grueling fight. All in all, I found Crush Your Enemies to be an enjoyable experience. It’s by no means perfect, due to its repetitive nature, and occasionally harsh AI. There’s also the issue that some are going to find the mechanics to be too basic. I personally soaked in the simplicity of it all, using it to balance my varying strategies and overcome anything the AI would throw at me with a bit of thought and patience.